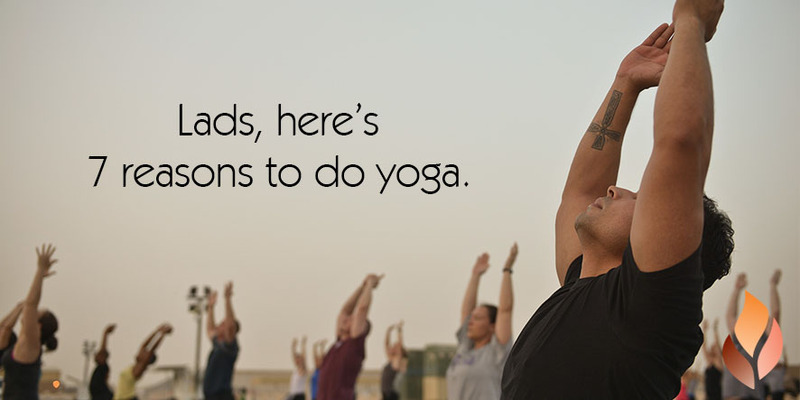 Home » Events and Blogs » Blog » Lads, here’s 7 reasons to do yoga. Lads, here’s 7 reasons to do yoga. While women are still the majority in yoga classes, there’s a strong movement of men not only trying yoga, but striving both on and off the mat. Yoga alleviates pain and injury. Safety and alignment are the absolute first priorities in yoga. Yoga demands that you do not push beyond what you are capable of doing safely. Clear physical landmarks and attention to the breath prevent you from pushing past your limits. There’s always a variation or modification to keep you safe while still progressing and challenging yourself. Within the first month of a regular yoga routine, you will alleviate your pain and injuries – beyond that, yoga will help take your health to a whole new level. Yoga keeps your body fit, flexible and strong. Many men say, “I’m not flexible enough to do yoga.” That is like saying, “I’m not strong enough to lift weights.” The poses are powerful and specifically designed to open and strengthen your body efficiently. Yoga will make you more flexible, light and in many ways stronger than any other exercise – without wrecking your body! With patience and steady practice, you will become more open than you’ve ever imagined. The right combination of strength and mobility is key, whether you’re a professional athlete or just trying to age gracefully. You will tone and strengthen muscles that you didn’t know you had. The small muscles in your back that have been deteriorating from that desk job will be getting a long-awaited wake-up call. With a commitment to yoga, you will be a lean, mobile, strong and physically fit yoga machine. Yoga will provide the fun challenge you crave. Yoga is more than just sitting around, humming and talking about your feelings. As a former collegiate wrestler, I can honestly say that some yoga classes are more challenging than any workout I’ve ever done. It will be humbling at times, but worth it. You will learn how to challenge yourself without being competitive. Competition will result in injury. Most men come from a strong athletic or business-minded background, where competition is fierce. Yoga teaches you to challenge yourself intelligently and completely without being overly aggressive. Learning new poses and noticing real progress is addicting! The light-hearted, compassionate attitude in yoga will help you to not take yourself too seriously, even while you’re sweating it out. Yoga will help improve diet, sleep and overall health. Once you’re feeling the physical benefits of your yoga regimen, you naturally begin to shift your diet and sleeping patterns. You will no longer want to eat a pint of ice cream or stay out late on a weeknight knowing you’re doing these healthy things for yourself. During yoga, you will notice your mind is so focused on what you’re doing that it is impossible to think about your job, bills or anything else. You find yourself fully in the moment, and that complete focus puts your mind at ease. Afterward, you will feel grounded and relaxed. The combination of your body and mind feeling fantastic is a recipe for practical, healthy lifestyle changes. The whole point of yoga is to live your life to the fullest. Whether you love to run, fish, golf, play basketball, travel or play with your kids without hurting yourself – yoga will help you do the things you love better and longer. While the yoga poses are fun and a strong tool, they’re not the point. What matters is that when you feel great, you are able to truly savor life. Yoga improves your performance and relieves stress. Yoga is the fountain of youth.